In 1902, the architect J S Fleming published a book, The Ancient Castles and Mansions of the Stirling Nobility. It had hundreds of drawings, mainly of the buildings in the Top of the Town which have long since been demolished. Another artist, Alexander Douglas Junior, visited some of the buildings featured in the book and made watercolour drawings of them. The Old Coffee House at the end of a close off Bow Street, was one of them. The building dated from the 17th century but was remembered locally as the headquarters of Bonnie Prince Charlie during his siege of Stirling Castle in January 1746. For many decades, it was the principal hostelry in Stirling, used by farmers on Fridays when coming to the market in Broad Street. It was also the meeting place of the gentlemen of the town. For a time, the horses for the Glasgow and Perth coaches were stabled there, before the modern facilities of the Golden Lion were built in 1786. J S Fleming examined the building in detail, noting the oak roof, with oak pegs fixing the slates. The main chamber was wood panelled with Ionic columns. 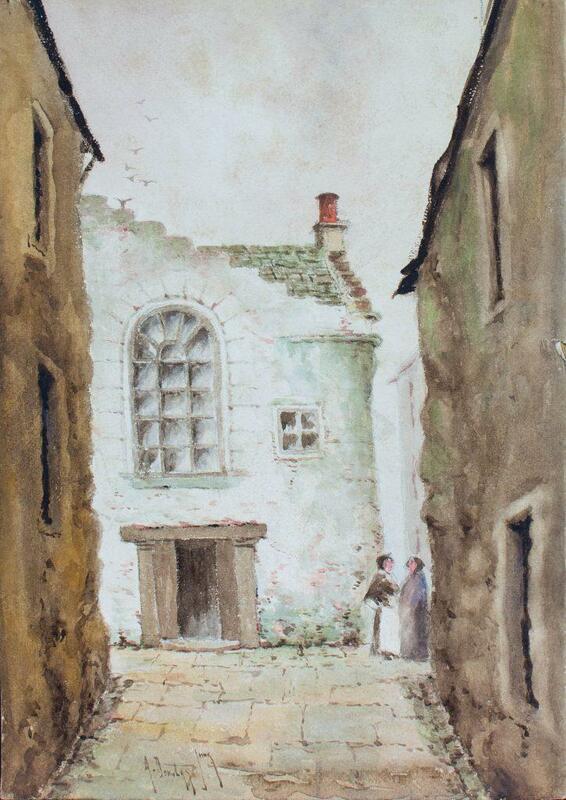 This is one of several watercolours found in a Stirling skip by James Hearsum and shared with the Stirling Smith Art Gallery and Museum.